We now know why this test had a null result. To find out more go to: http://etheric.com/nassikas-thruster-version-three-test/. Also that posting describes a new version of the Nassikas thruster which should produce two orders of magnitude greater thrust than the version 2 thruster. In this update the October 21st test video was redone to include a clip of a second DC test which was inadvertently not included in the previous version of the video. This clip shows the coil pendulum moving in the direction of its wider end by 9 mm, hence in a direction opposite to what was predicted. I have accordingly modified below the discussion of the Oct. 21st test. 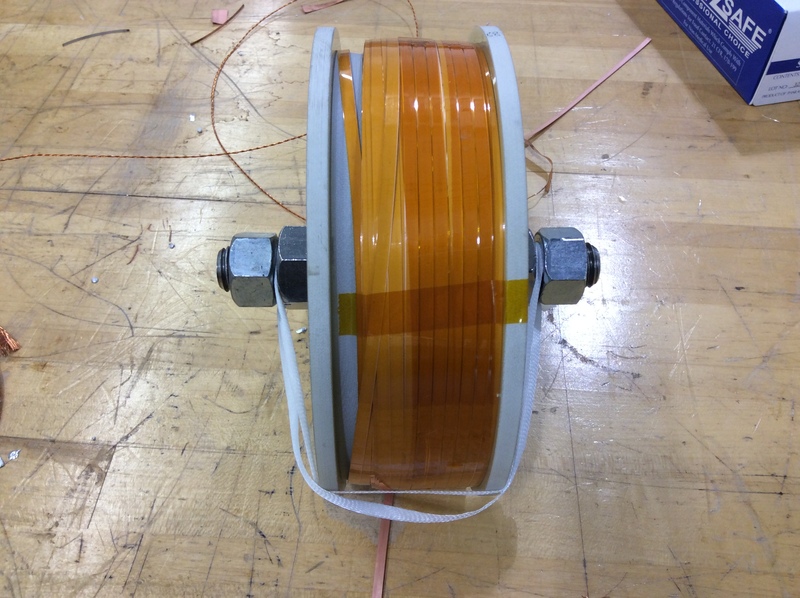 Conical REBCO tape superconducting coil wound by Superpower Inc. on a form with a 3 degree slope. Another side view of the coil. Earlier this year we had conducted a crowd funding campaign to raise money in order to conduct a test of the Nassikas thruster II propulsion device (https://www.indiegogo.com/projects/superconducting-levitation-thruster#/). The coil was wound by Superpower Inc. (Schenectady, NY) in early October and tests were completed this past week at the Superpower facilities. They were attended by Dr. Nassikas and myself and Superpower technicians. Sadly, I report here that the test results showed no evidence whatever that the conical superconducting coil we had made produced any axial thrust. Based on computer modeling of our conical coil previously carried out at Superpower, we had predicted that the coil (with its 3 degree taper) should have produced an axial thrust of 66 kg when energized with a current of 30 amperes. In our tests we instead energized the coil with up to 60 amperes, which should have produced a magnetic field strength twice as great as previously planned (i.e., ~0.4 Tesla) and thrust four times greater than previously estimated, i.e. 265 kg of force. A force this large, about a quarter of a ton, should have slammed the coil against the wall of its liquid nitrogen container and propelled the entire assembly across the room. In actuality, we observed no axial displacement of the coil in the direction of its narrow end, as had been predicted. Test rig for the conical REBCO tape coil tested on October 17th. 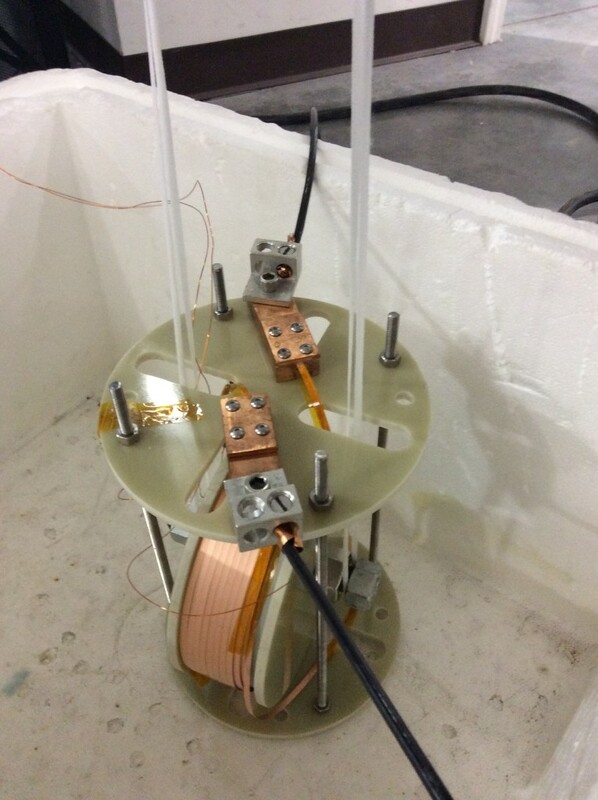 The first test of the coil was conducted on October 17th. The coil was suspended in pendulum fashion using a set of plastic ribbons 1.36 meters in length. Our intention was to look for any sign of lateral displacement. 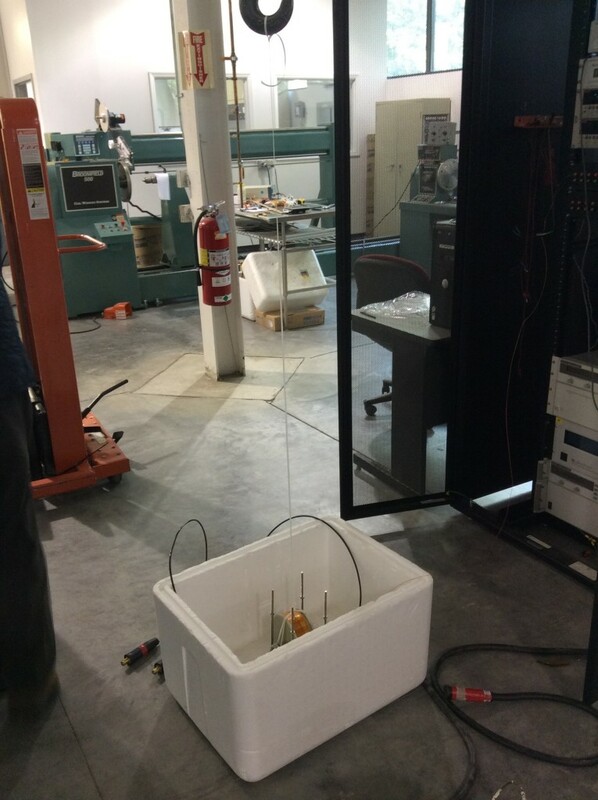 Our pendulum test setup was capable of indicating a lateral displacement of as little as 1 mm. To make this minimal displacement, our coil assembly which weighed 3.2 kg would have had to generate a force of 2 grams. But we saw no displacement at all in the October 17th tests. So we can conclude that, if the coil was generating any force at all, it would have had to be less than 2 grams, or about 120,000 times less than we had expected. Dr. Nassikas discussing the test setup with one of the Superpower techs. 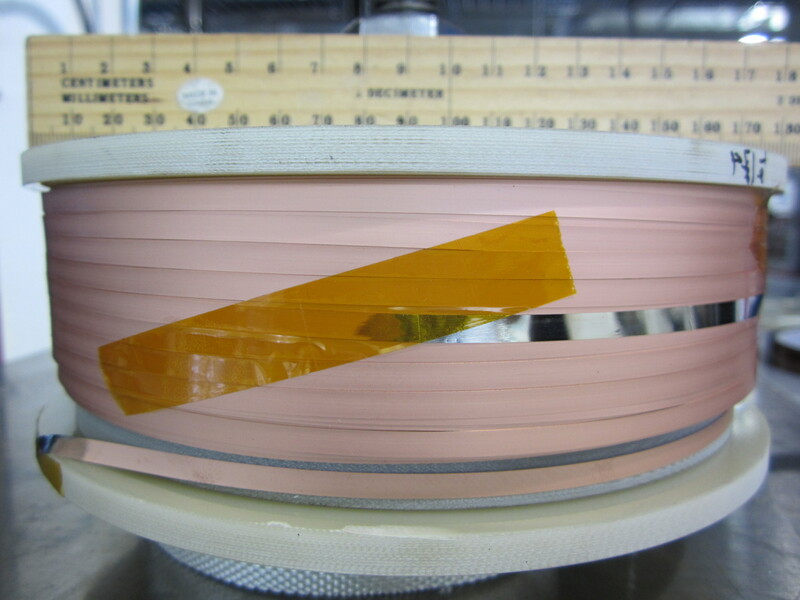 Prior to conducting the test we had noted that the outer layer of coil windings did not have a uniform progressive 3 degree slope, but in some areas the coil surface appeared to have a zero inclination (approaching a cylindrical shape) and in some small end sections the surface even had a slight opposite slope. This was due to the difficulty of forcing the superconductor tape to conform to the intended 3 degree slope, which it did not always do as a result of periodic kinking. There were a total of 400 turns, and hence many consecutive layers that would have propagated any developed unevennesses towards the surface. So all of the windings of the coil did not have the ideal 3 degree inclination. But even if half had this intended inclination, we should have observed at least 150 kg of force, and yet none was observed. One thought we had was that the magnetic field was not floating free of the coil but had attached to the superconductor through a phenomenon known as pinning. In such a case, any axial Lorentz forces developed by the coil would only have produced an axial stress in the coil and no displacement. We surmised that if pinning was present in our tests that it could be avoided by energizing the coil with a 60 cycle AC current. Even though the current reverses every sixtieth of a second, so also does the produced magnetic field, with the result that the Lorentz force should always be in the same direction, and any resulting axial force. We imagined that repeatedly reversing the magnetic field would prevent it from pinning to the superconductor coil structure. This test was carried out on a different date (October 21st) because first a 20 amp power source for the coil needed to be put together. We also decided to remachine the coil’s conical plastic support form with an 8 degree inclination and rewind the coil on this new form. A quick check determined that an 8 degree inclination was feasible for winding the superconductor tape. Particular attention was paid to winding the coil so that the tape conformed to the form’s 8 degree inclination. But even so, unevennesses developed in the windings and the result was that on its outer surface the coil indicated an average inclination of only 2 degrees. As you see in the photo below some of the outer windings on the left of the coil actually had an inclination opposite to the intended inclination. Although it was difficult to determine what was the overall slope of the windings, probably a reasonable guess is that they had a net slope of 5 degrees relative to the coil’s axis. All the windings were insulated with a thin layer of Kapatan tape to prevent winding-to-winding shorting during the AC test. Coil prepared for the October 21st test, wound on a conical form having an 8° inclination. Another view of the coil. The photo below shows how the coil was suspended in pendulum fashion. 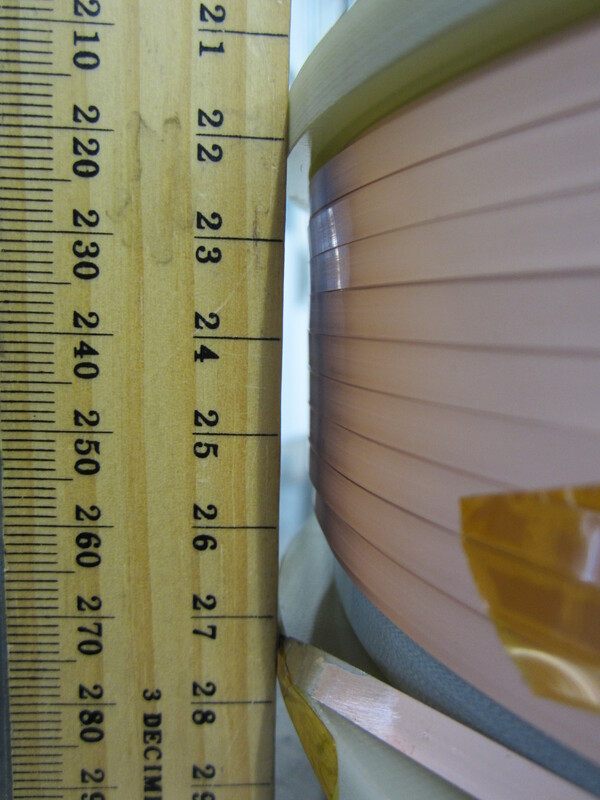 In this case a single plastic ribbon was used giving a length of 1.525 meters from the fulcrum to the coil’s axis and 1.34 meters from the fulcrum to the ruler gauge. Coil shown suspended in pendulum fashion. The displacement could have been due to nitrogen bubbles in the vessel creating an asymmetrical pressure on the coil. The displacement could have been due to liquid nitrogen currents circulating in the cooling vessel. As seen from the movement of ice on the surface of the liquid nitrogen, these currents were quite rapid and we had not put any baffles around the coil to act as shields from these currents. 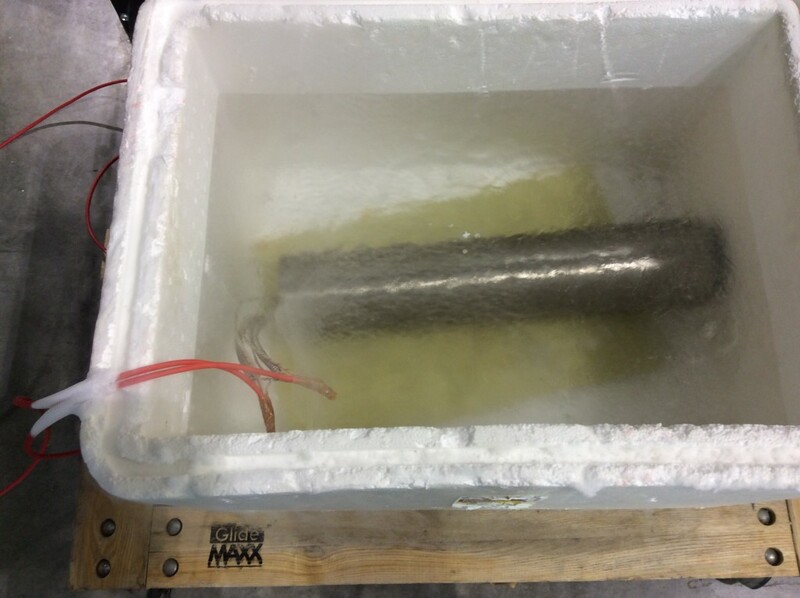 Current load for the AC test shown in its liquid nitrogen cooling bath. We also had on hand a piezoelectric digital balance for measuring any developed force up to 75 kg and another balance capable of measuring up to 2 kg of force. But due to the negative results of the pendulum test, these scales were not put to any use except to check the weight of the coil. We do not fully understand why the above test results were negative. Here are two possible explanations. • One possibility might be that the magnetic field was pinning itself to the coil structure even in the AC test which had been designed to minimize this effect. As mentioned earlier, if the magnetic field had pinned itself to the coil structure, it would have created no net axial movement of the coil, only an axial stress on the coil windings. But no axial movement of the windings within the coil was observed. • Another possibility may be that the force radially expanding the coil is not due to a Lorentz force, as commonly thought, but rather to an Ampere longitudinal tension which instead would be directed along the length of the coil windings rather than perpendicular to the windings. If the coil were in fact producing only an Ampere force, no axial force could develop, the Ampere force being directed along the axis of the winding inclination, rather than perpendicular to it. When I speak here of Ampere tension I am referring to the force that is observed to explode wires longitudinally when they are energized by a strong current. For Lorentz forces not to be present, this would imply that the coil’s magnetic field was unable to penetrate the surface of the superconductor tape to interact with the supercurrent circulating within. In fact it is known that superconductors tend to expel magnetic fields from penetrating their surface. We had assumed that some fraction of the magnetic field would have succeeded in penetrating sufficiently to interact with the current flowing within. But we may have been wrong, and actually no Lorentz forces were being generated. However, I just communicated with a GE Engineer who is the inventor of the superconducting generator and he says that strain gauge measurements have been made on superconducting coils which confirm that the coil expanding force is perpendicular to the wire, hence a Lorentz force. If so the Ampere force theory would not be a valid explanation of the absence of an effect. The Ampere force, on the other hand, would nonetheless have been present in the superconductor since it exists within all conductors whenever a current is flowing through them. Standard theory of superconducting coils assumes that it is the Lorentz force that is responsible for distending the coil’s windings. If this is not so and the force is actually due to the coil’s longitudinal Ampere forces, then this demands that the superconductor coil industry entirely rethink its theory as to where this coil-expanding force comes from. I consulted with one physicist who confirmed that the longitudinal Ampere force scales according to the square of current. So too does the Lorentz force. The Ampere force is not as well studied by the physics and engineering community and could perhaps have been overlooked as the true cause of the coil distending force. In view of the present findings, we are not encouraged to conduct a liquid helium test of the coil. Although, magnetic field pinning is not observed in low temperature superconductors such as tin-niobium alloy operating at liquid helium temperatures. So if pinning were the reason why a positive result was not found in the test of the REBCO tape coil, this factor would not be present in a low temperature superconductor test coil. However, such low temperature superconductors are in the form of wire (circular cross section), rather than tape (rectangular cross section). So it seems to me that it would be difficult to establish a specific inclined plane for its super current and hence a resultant axial force. 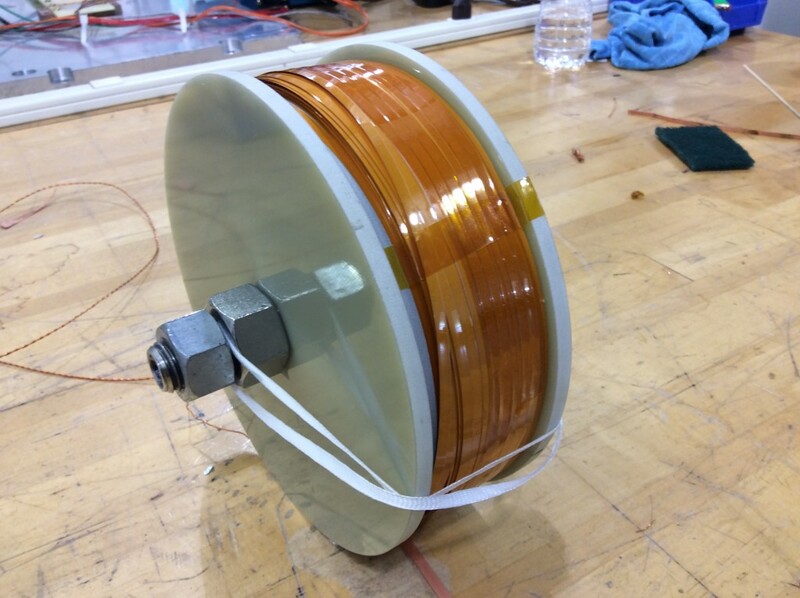 The only possibility might be to build a conical coil with a low temperature superconducting tape to be tested at liquid helium temperatures, if such a tape superconductor can be found. But if Lorentz forces were actually not present in the REBCO tape coil, it is also unlikely that they would be present in a low temperature superconductor coil. 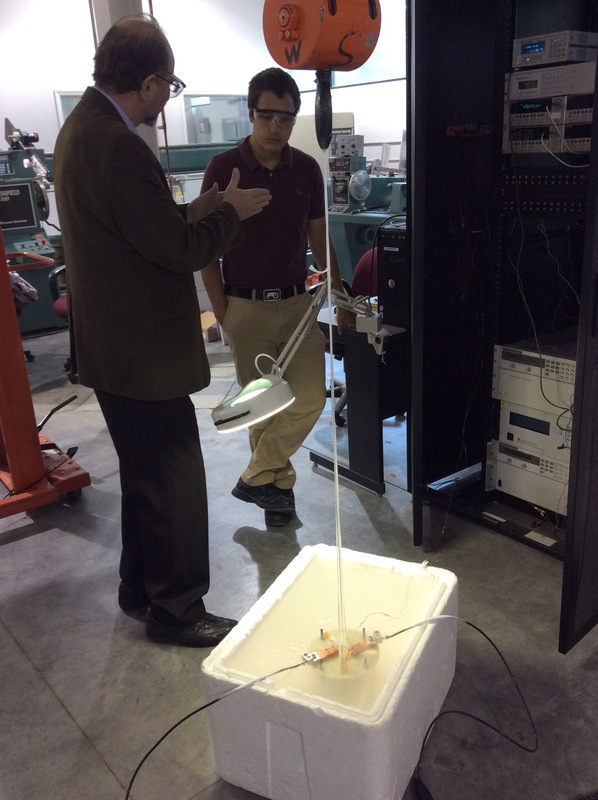 With the present discouraging results, I feel that time is better spent if Dr. Nassikas concentrates his efforts on conducting low temperature tests of his first thruster invention which has already been shown to work at liquid nitrogen temperatures. Even if one were to believe that the temporary 9 mm displacement were due to some intrinsic force generated by the coil itself, this still amounts to only 21 grams, which implies a thrust to weight ratio of only 0.0067, which is half of what was indicated by Dr. Nassikas’ first thruster invention. Also there is the concern that a similar displacement was not seen in the majority of the tests. This fact alone would point to random actions of the environment acting on the coil. Both Dr. Nassikas and I greatly appreciate the help of those who donated to make this experiment possible. We regret that the experiments did not have positive results. Whether they may point to a flaw in the standard theory of the force that causes superconducting coils to expand when energized needs to be determined. Dear Dr. LaViolette, if you were to mount your original thruster on the perimeter of a horizontal disc and put a counterweight on the other side of the disc, this would balance it. Fit a thin vertical shaft through the disc with needle point ends for very low friction bearings. Once the super conducting nozel was cooled, this should rotate! If it was then mounted in a hermetically sealed container, first the liquid nitrogen is fed in till components are down to operating temperature, then sucked out by a standard suction pump till a hard vacuum is obtained. Now, since there is no gas inside the container, there is no impediment to rotation at all. This would also prevent heat conduction into the container. If no load was applied, the disc would accelerate up to self destruct speeds. An alternator could be added to the end of the shaft and an electrical load applied. Without this load, the disc would just accelerate indefinitely. Obviously, the larger the diameter the disc, the more torque is produced. You could also of course, have several thrusters on the disc and have several discs stacked up above each other on the shaft. In space, with permanently low temperature, the unit should run for ever. I am always looking for free energy. You definitely have something here! Keep up the good work. I think the superconducting material to be acted upon should be separate from a superconducting magnet causing the field. Similar to mark 1 arrangement. Why are you operating with only 60A? I mean you have a superconductor there and you are operating with only 60A? This can be done easily with normal copper wire. You should be able to operate this coil with some thousand to million A. 60 amps was enough current to demonstrate that the device would not work as we had believed. We should have observed many kilos of force at that current and none was observed. The current used was the most we could put through the coil without causing the magnetic field to quench its superconductivity. I’m an admirer of your work, Dr. LaViolette, and enjoyed your book “Secrets of Anti-gravity”. Can you rule out that the Nassikas thruster 1 wasn’t interacting with the geomagnetic field to produce a net force? Did you ever conduct the experiment inside a Faraday cage? There’s a patent from How Wachspress (link: http://www.auditac.com/levitators/patent.html) involving conical coils that were supposed to produce a net force within the geomagnetic field. I replicated his design using copper coils but couldn’t produce a net force. Interesting similarity to the Nassikas thruster, don’t you think? Thanks, and best of luck with Nassikas thruster 3. For the thruster I the video shows that it hangs plumb when it warms above its critical temperature and loses its superconductivity. This proves beyond a doubt that external magnetic fields have nothing to do with the thrust. A thought I have had is if this device is considered open source or not? Forgive me for not understanding the patent process. Am I wrong in thinking that an open source device might have a couple advantages? One being completely open construction, testing and results (in real time). The second advantage resulting from the first, where no patent suppression or governmental intervention in case you do hit the jackpot? Although I see some dimensions referred in diagrams, there is no discussion of test procedures before the fact. Is the superconductivity community willing to help you overcome the pinning effect? Paul, surely you’re aware of the thousands of suppressed patents and devices that came to fruition only to be bought by someone and shelved. One final note I have is why did this test result dated October show up in late March? It makes my mind play out scenarios I’d rather not contemplate. I guess I’m wishing for more open source transparency. Our test results were posted last year on etheric.com shortly after October. Perhaps you were having a problem with your browser. No suppression scenarios so far. Paul, does the thruster require superconductive materials to prove there’s thrust? (I’m referring to the electromagnetic thruster) Why did 3 degrees become the optimal angle? Why not 19.5? Do you ask whether someone has produced the effect using a nonsuperconducting materials such as a copper coil? Yes, we have posted at this site about someone who demonstrated small effects with a small conical copper coil. Dr LaViolette,in your Nassikas thruster I article,you suggested to power a spacecraft with Paul M Brown’s nuclear battery.Why didn’t you suggest to power it with a superconductor motor-generator?I’m not familiar with superconductor but wouldn’t it be better to be powered by an energy source that doesn’t exhaust?And correct me if I’m wrong that the amount of force generated by a superconductor coil is dependent on the amount of energy(current x voltage)stored in it? For superconductor coils they speak just in terms of current, not voltage, since voltage is essentially zero in the superconductor. Yes one might power a craft by using Nassikas thrusters in pinwill fashion to produce shaft power for a generator. According to Thomas Valone,pulsed voltage has the strongest EMF.Perhaps you should try applying that to the current of the superconductor.You tried AC of 60 cycles per sec,next time start from 60 pulses per sec and increase the frequency,see if it would improve the effect. 60 times per second is the fastest that the company was able to change the current on the superconductor. If we could have increased the frequency, we would have. I think this is a properer forum to put this.Dr LaVioLette your book Secrets of AntiGravity Propulsion is interesting.What do you know about The Capacitance Theory of Gravity by Morton F Spears? Am not familiar with it. Is there any reason why a more powerful permanent magnet can’t be inserted into a larger YBCO nozzle to determine how this technology scales? Why not build a 4 gram thruster? At some point it would be impractical to construct a more powerful device without using an electromagnet, but it seems equally obvious that as the force produced progressively increases it won’t be possible to explain it away as any sort of experimental error. NASA didn’t go from experiments with Redstone to Saturn V without several intermediate steps, so why are we trying to go from substantially better than any ion engine ever built to substantially better than a RS-25? Re. Nassikas thruster I: We used the most powerful magnet practical for the experiment. To use a stronger magnet requires that we test at lower temperatures. Our next planned experiment for this thruster is to test it at 40 Kelvin inside an evacuated cryochamber. The decision to test the Nassikas thruster II was because a patent was filed which starts the clock ticking. At one point hundreds of thousands of dollars are required to keep the patent active, which makes it necessary to determine if the idea indeed works as theory predicts. For our next experiment we intend to test the thruster II at liquid helium temperatures to see if there will be a positive result. About your Nassikas thruster, I have an idea that perhaps some holes in the plate could be devised to maximize the thrust of the device, yet conserve it’s energy. I would also say, that the Super Conductor or one of them or more if necessary, should perhaps some to be used as a SMES device(s). Which if there could be some Electron charging device attached to the SMES from a Solar source, could be an inexhaustible power source for the propulsion device. SMES have a reputation for being 95%+ efficient as energy storage devices. Actually, if there is something inside the Bosnian pyramid emitting a radio beacon of some sort, I can only imagine a SMES as the power source. Dr. LaViolette, given your background and theory, I am curious as to why you have not pushed more in other directions with your own concepts. For example, a fundraising effort for incorporating your modeling with some actual corroborated physical results would be excellent. Or perhaps superior progress in the modeling effort that would lead to some experiments rather than mental work that seems to be done up to this point. Sorry for your dissapointment dr Laviolette. If the experiment is not wrong, then the science behind maybe is wrong… . But we shall never quit trying… . the Cosmic Induction Generator (CIG). So named because the CIG produces intense lines of dielectric induction that cause a plasma to form which takes on the shape and form of a galaxy in space (the Cosmic aspect). The aspect that is extraordinary is the plasma doesn’t take on random shapes or motions- it forms a mini universe! Witnesses to the original experiment described the plasma as being “alive”, “conscious”, and having a “memory”. Do entities that decide to appear when living electricity is present? Perhaps it is an environmental issue, and the effect you are seeing is not only a local event. But then I started to come across other information, that made me believe that a “Maunder Minimum” was just the “Usual Suspect” and had nothing to do with what was happening. 1st thing, was the Sun had/has somewhat changed color. The second thing, was the Black Holes appearing on the Sun, which they said they were Coronal Holes, well up until their appearance, Sunspots were defined as “Coronal Holes”. So I have been wondering, “is there some relationship” between manmade EMF generation and the obvious interruption of the Earth & Sun dialog. Upon reading your report Dr. Laviolette, I cannot help but think that either the “New” EMF environment might be effecting your results OR you are not using the proper electricity. Hopefully the revised posting answers your question. We could not do this without damaging the coil due to voltage spikes. The most rapid change of current was in the AC test. I am thinking about the possibility to cooperate with laboratories like the HFML in Nijmegen, Holland (where I live close by). Maybe they are willing to share their test-results and maybe part of it can be useful for this electrogravitics-project. what a bummer, I was hoping for a ride. Although the outcome of the experiment was not what was expected, it seems that you have revealed information re: Lorenz forces in superconductors, and this information in itself may be useful. Keep up the good work! I am happy to hear about the results, even if they are negative. This means that the project is open and real science. Now a smaller step between the first and second prototype would be helpful. Good luck with the project. It is worth it ! Thank you for sharing your results. It is important to test theories. We learn from positive and negative results. Sometimes failures are in the procedures and sometimes they are in the theory itself. This was not a wasted effort! Disappointing results Mr. LaViolette. I am reminded of how many similar feeling results Edison experienced before he finally gave us the electrical light bulb. I hope Dr. Nassikas perseveres with this.